This pic is about three or four years old. One of the few times I've painted from photos taken by me of someone I knew. Came out pretty nice and got published in Expose 2 and got me a couple other awards. Hope you like. That's all kinds of bizarre and awesome. Nicely done, and thanks for crediting and informing me. No worries. Thanks for your concern and liking the picture. This is a great picture. It's no wonder why Buckley stole his character from it. Thanx, hope nothing like this or worse hapns again. This is a great piece and it's a shame that it was blatantly copied by Tim Buckley. I hope you make sure to get your name out there and the credit you deserve. Thanx. I've indeed been credited by now on the matter and it's all good, no need to make a bigger deal of it. Hola, solo para confirmar que Tim Buckley, autor de Ctrl-Alt-Del, esta plagiando tu diseño con fines de lucro, ya que sus historietas son publicadas en forma de libro periodicamente (ademas de vender otra mercancia directamente relacionada al comic y sus personajes) y no es justo que tu arte sea robado de esa manera. Gracias por el avizo. Ya llegue un poco tarde al asunto, pero creo que aun asi no hay necesidad de hacer mas. En mi journal puse mi respuesta a Tim. Well, this whole Tim Buckley business led me to your art here, and I am thoroughly impressed. This is beautiful. Thanx, glad you liked it. Hey man, I would listen to the above commenters and go confront Buckley before he profits off your work. Thanks for your concern. You can read more in my journal about this if you like. Yeah, like the other guy said, Tim Buckley's newest character Abby in "Ctrl-Alt-Del" is a complete ripoff of your design. Tim Buckley is notorious for stealing images off Google Image Search and using them as backgrounds. Now he appears to be using it to steal characters as well. It should also be noted that although Ctrl-Alt-Del is a webcomic, older story arcs have been officially published in book form for profit by Blind Ferret. The newer story arcs (including the one featuring Abby, a central character) will surely follow sometime in the future. Thanx for the info. I didn't even know about the google search results before this hapnd. I posted my response about this in my journal. Thanx. Hey HecM do you know Tim Buckley (B^U) and his webcomic CAD? He obviously stole his idea for the punk girl in his newer comics, you should really sue him for that. Looked into it. He apologized and posted my response on my journal. Thanks. I love this picture! I really like the shirt and the angry smiley pin. pretty cool lots of personality, and I love the brushstrokes. Really nice jeans . Like how they look. thanx, they have a bit of jeans texture overlayed on them. Its really awesome, i love the piercings. 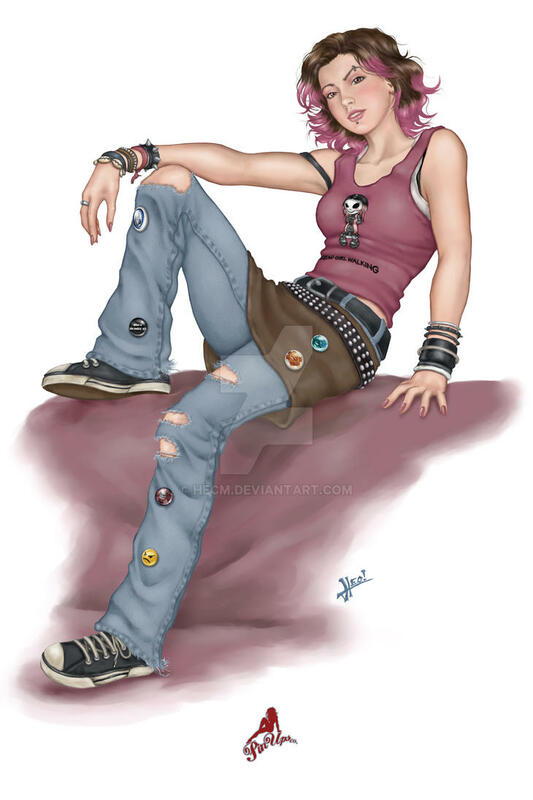 Heheh, yeah I added those extra, the girl that modeled for me didn't have'm, same for the pink in her hair. Very nice job. Coloring looks great! That is truely beautiful. I like the texture of the ripped jeans.